This ia brief article about a speech synthesizer, but in the last paragraph it sounds like they were actually doing research into psychoacoustic audio compression. 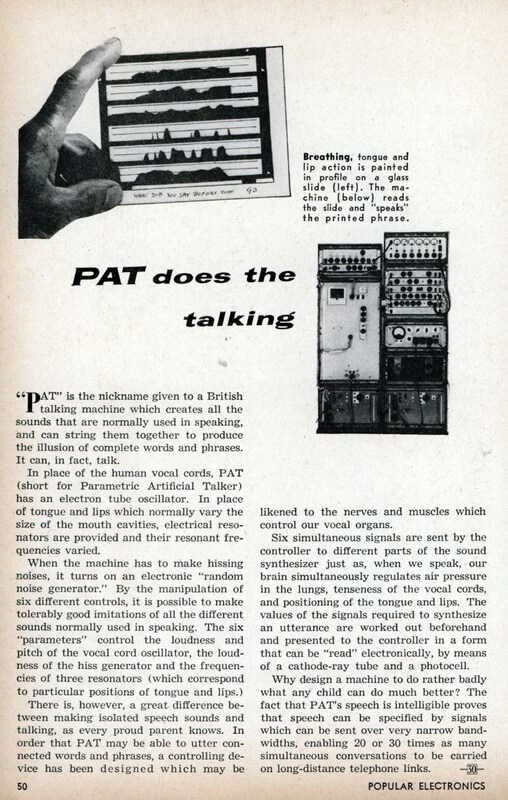 “PAT” is the nickname given to a British talking machine which creates all the sounds that are normally used in speaking, and can string them together to produce the illusion of complete words and phrases. It can, in fact, talk. In place of the human vocal cords, PAT (short for Parametric Artificial Talker) has an electron tube oscillator. In place of tongue and lips which normally vary the size of the mouth cavities, electrical resonators are provided and their resonant frequencies varied. likened to the nerves and muscles which control our vocal organs. Six simultaneous signals are sent by the controller to different parts of the sound synthesizer just as, when we speak, our brain simultaneously regulates air pressure in the lungs, tenseness of the vocal cords, and positioning of the tongue and lips. 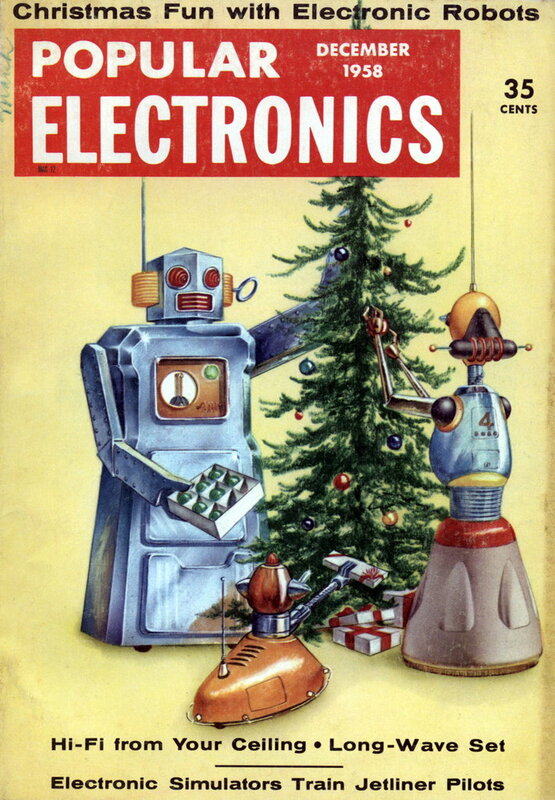 The values of the signals required to synthesize an utterance are worked out beforehand and presented to the controller in a form that can be “read” electronically, by means of a cathode-ray tube and a photocell. Why design a machine to do rather badly what any child can do much better? The fact that PAT’s speech is intelligible proves that speech can be specified by signals which can be sent over very narrow band-widths, enabling 20 or 30 times as many simultaneous conversations to be carried on long-distance telephone links.